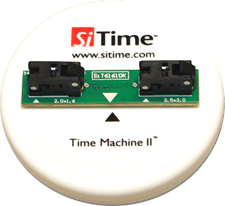 The Time Machine II is a complete MEMS oscillator programmer kit. It allows you easily configure SiTime's field programmable oscillators to your exact specification and create customized drop-in replacements for legacy quartz devices in seconds. Part 2 of 2. A video tutorial on how to mount devices, use the part number generator, plus other features of the kit.